Size: 100ug in PBS, pH 7.4; 50% glycerol, 0.09% sodium azide. GABA is the major inhibitory neuro- transmitter in the vertebrate brain. GABA receptors consist of five subunits that form a chloride ion channel. Subunit families α, β, γ, and δ have been studied extensively; π and ε have been identified recently. Studies of recombinant GABA receptors have shown that individual subunits and their subtypes confer different sensitivities to GABA receptor modulators. Subunit subtypes are differentially expressed throughout development and in different CNS regions, reducing the total number of possible isoforms that can be formed in different brain regions and in individual cells. Antigen: Fusion protein corresponding to aa 355-394 of mouse Alpha 1 GABA-A receptor (accession no. P62812). This antibody recognizes human, mouse, and rat Alpha 1 GABA-A receptor. It does not cross-react with Alpha 2 or Alpha 3 GABA-A receptors. 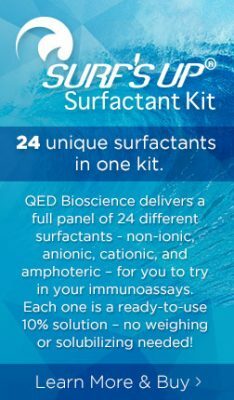 Immunoblotting: use at 1-10ug/ml. A band of ~55kDa is detected.